This place is gorgeous and would be primarily used for a little stroll or for attending an event like the annual flower festival. It’s small but very pretty. It may be nice for a run or picnic but don’t try to play any sports or whatnot here. The pics I have posted are from the flower festival so they may or may not represent the park on a normal day. An absolutely beautiful park. Great for adults and kids. So nicely presented with beautiful gardens. Well worth the visit. Relax and enjoy. The name on maps maybe Buak Hard Public Park. What a lovely park! Great place to relax and definitely a change of scenery compared to the hustle and bustle of the city. Even during on a hot day at noon time, the nicely cut grass, fish in the water, and trees are so calming. Fitness machines are cool if you want some exercise in. Get some cool beverage or popsicles and chill on the grass or benches. Play areas with swings and great for kids too. It’s a really nice place to relax and take a step back. Beautifully maintained. Giving this a 5-star because it is literally the only outdoor playground we found worth visiting in Chiang Mai. We went at least 20-time during our 6-week stay in Thailand. My 5-year old son LOVED it. The playground was always full of kids and lots of families sitting around the pond with blankets and picnics. There are a couple small cafes and a couple pop-up food stands for a snack, but not a lot of options for a meal. We had a lovely afternoon at Nong Buak Hard park in the southwest corner of Chiang Mai's Old City. There are plenty of pathways and shaded areas to take advantage of in on a sunny afternoon. Manicured lawns and gardens surround a lake filled with fish. While food services were not on offer when we were there, there are several vendors offering packaged snacks, as well as bags of fish food for 10B. Along the outer ring of the park is exercise equipment, and many of the locals were using it and going for a jog. 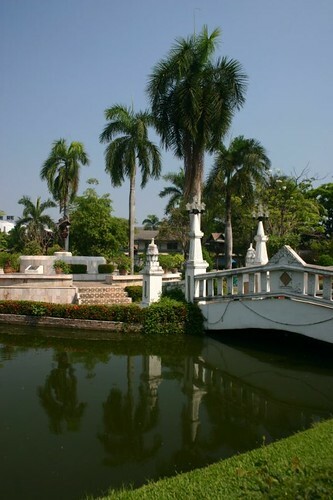 A lovely spot to relax in Chiang Mai!